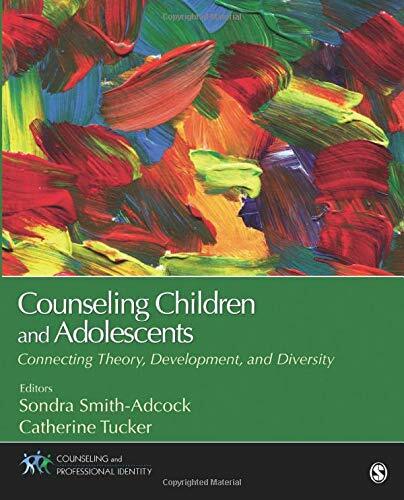 Counseling Children and Adolescents: Connecting Theory, Development, and Diversity reviews the most relevant theoretical approaches for counseling children and focuses on connecting key theories to application using case studies. The book’s approach is broad, addressing a range of ages, approaches, and interventions that are applicable to varied settings. Sondra Smith-Adcock and Catherine Tucker have laid out an integrated framework that focuses on development and diversity. In addition, a unique aspect of this text is its focus on neuroscience, the developing brain, and the impact of early childhood trauma on development. Each chapter in the text includes a set of case illustrations, guided activities for the student to apply independently and in the classroom, and a list of resources in print, on the web, and on film. Counseling Children and Adolescents: Connecting Theory, Development, and Diversity is part of the SAGE Counseling and Professional Identity Series, which targets specific competencies identified by CACREP (Council for Accreditation of Counseling and Related Programs). To learn more about each text in the series, please visit www.sagepub.com/cpiseries. "The integration of CACREP Standards, school counseling strategies, and specific developmental issues make this a great text for teaching child and adolescent counseling courses."